Well, we're nearly halfway through this season of Extant, and one thing is clear: Molly Woods is dealing with the world's most inept conspiracy. And the show just decided to spend an entire episode revealing things to its characters that the audience already knew. Between Comic-Con and post-Comic-Con hijinks, I missed a couple of weeks of Extant, and when I got caught up on the show again, I was confused. I wasn't confused about what was going on—the show's pretty good at spelling that out each week. I was confused as to how all of these characters manage to operate space and robotics programs when they are all so conveniently stupid. Sam somehow managed to testify as an expert witness on her brother's behalf without anyone realizing the two of them were related. The bigwigs at ISEA didn't want Sam to know that they were experimenting on Molly and yet still allowed Sam to examine her upon her reentry. Molly believed that ISEA impregnated her with her husband's baby. (Okay, that might get a pass because she certainly wanted to believe that, even if it was clearly a lie.) ISEA is still spying on Molly and yet doing such a poor job of it that she managed to smuggle her supposedly erased footage from the Seraphim home and her boss doesn't know that she saw the energy alien thingie that killed her worms—and apparently impregnated her. 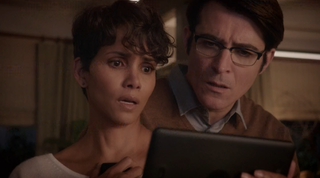 But Extant's biggest problem is one of suspense, or rather the lack thereof. The conceit of this week's episode is that the conspiracy is trying to convince Molly and John that Molly hallucinated the pregnancy, much like she hallucinated Marcus and Tim. The problem is that we, as the audience, know Molly was pregnant. Extant isn't told entirely from Molly and John's points of view; we've seen the conversations between Sparks and Yasumoto and between Sparks and Sam. Perhaps if we had been left in the dark, the idea that Molly might be imagining the pregnancy might have worked. Instead, spending so much time with John questioning whether Molly's pregnancy was real feels like a waste of an episode. And aside from the confirmation that Sparks had the fetus removed from Molly's uterus at the end of last week's episode (which does make a ton of sense; don't leave your precious cargo with a lady who is not on your side), this week's episode mostly reiterates things we already knew: Yes, Molly was pregnant. No, John isn't the father. Yes, the father is probably some alien being. No, Sam can't help her. Yes, Julie thinks that John and Molly are terrible parents for Ethan. And she's probably right. But at least the episode puts Molly on what looks like a clear path. She knows she was pregnant and that the best way to move forward is to pretend that she believes she went mad. So at least now she's in a position to re-take control of her life and learn what really happened aboard the Seraphim—and what happened to her fetus. And it doesn't seem like anyone in the conspiracy is going to be competent enough to stop her.